Dr. Wes: Is Maintenance of Certification Our Next Tuskegee? Is Maintenance of Certification Our Next Tuskegee? New Engl J Med 274(24) June 16, 1966 pp 1354-1360. “For the most part, doctors and civil servants simply did their jobs. Some merely followed orders, others worked for the glory of science." The Tuskegee syphilis experiment was an infamous clinical study conducted between 1932 and 1972 by the U.S. Public Health Service to study the natural progression of untreated syphilis in rural African American men who thought they were receiving free health care from the U.S. government. The Public Health Service started working with the Tuskegee Institute in 1932. Investigators enrolled in the study a total of 600 impoverished sharecroppers from Macon County Alabama. Three-hundred ninety-nine (399) of those men had previously contracted syphilis before the study began, and 201 did not have the disease. The men were given free medical care, meals, and free burial insurance, for participating in the study. They were never told they had syphilis, nor were they ever treated for it. According to the Centers for Disease Control, the men were told they were being treated for "bad blood", a local term for various illnesses that include syphilis, anemia, and fatigue. The 40-year study was controversial for reasons related ethical standards, primarily because researchers knowingly failed to treat patients appropriately after the 1940s validation of penicillin as an effective cure for the disease they were studying. Revelation of study failures by a whistleblower led to major changes in U.S. law and regulation on the protection of participants in clinical studies. Now studies require informed consent, communication of diagnosis, and accurate reporting of test results. The Tuskegee Syphilis Study led to the 1979 Belmont Report and the establishment of the Office for Human Research Protections (OHRP). Importantly, it also led to federal laws and regulations requiring Institutional Review Boards for the protection of human subjects in studies involving human subjects. Could the new American Board of Internal Medicine (ABIM) mandate for participating in their Maintenance of Certification (MOC) process unilaterally imposed 1 January 2014 so they can maintain a publicly-reported maintenance of certification "status" be violating ethical standards set forth by the 1979 Belmont Report? Let me explain why I think it does. The increasingly complicated test- and survey-taking exercise called "Maintenance of Certification" has never been scientifically proven to improve physician quality. Our society's inability to agree on a definition of a "quality" physician (and how to measure those qualities) is part of the reason why this issue has never been studied. For instance, should we define a "quality" physician on the basis of his or her empathy, surgical skill, lack of complications, ability to recall facts or some combination of these or other attributes? The reality is, it is nearly impossible to adequately define a "quality" physician at the outset. But the issue of maintaining "quality" health care delivery is critical to those paying for health care services (CMS and insurers, aka, "stakeholders"), especially now in this era of health care reform. Payers want to assure they receive the most value for their dollars spent in health care. Patients want to be reassured that they are receiving competent care by a physician, especially in a time where cost-cutting, deployment of unproven electronic medical systems, use of non-physician care-givers, and shortened physician training and work hours has occurred. Seeing an opportunity, the American Board of Medical Specialties (ABMS) and the ABIM stepped in to help the government define physician quality. Through the assurances of their leadership, the ABIM led "stakeholders" to believe that (1) quality is easy to measure (after all, they have a thorough testing "process") and (2) the responsibility for determining physician quality should rest with individual physicians. This leap of faith by government officials is similar to the Tuskegee era when government physicians were similarly obsessed with African American sexuality, believing that the responsibility for the acquisition of syphilis rested solely upon the individual. Because the Maintenance of Certification process imposed by the American Board of Internal Medicine is unproven, it is, at best, an experiment that attempts to assure physician quality on patients without a defined hypothesis (what, really, does the ABIM test with the MOC process?) or informed consent. The issue of informed consent is critical, in my view, because the psychological, financial, and social consequences of NOT passing the test to doctors and their patients have never been evaluated. 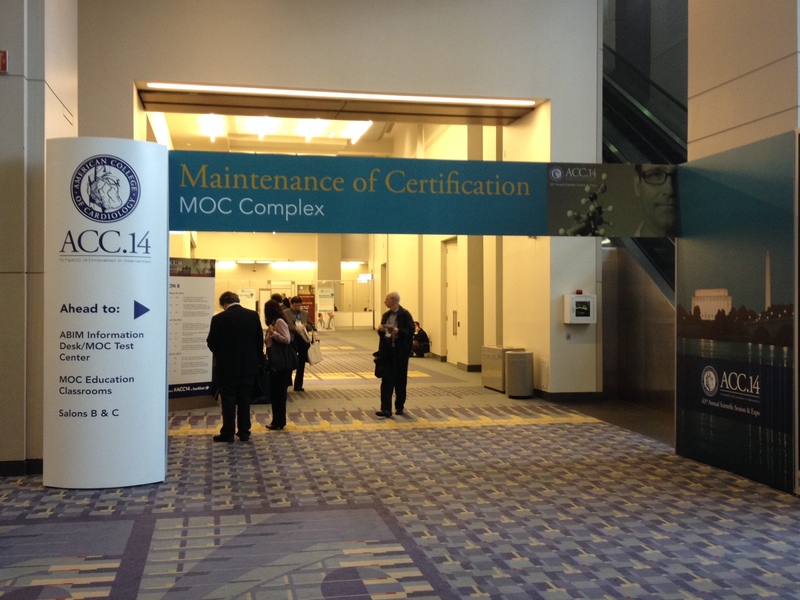 Yesterday, I attended the session entitled "Changes to ABIM's Maintenance of Certification (MOC) Process" at the American College of Cardiology Scientific Sessions in Washington, DC. Drs. Richard Baron, MD, President and CEO of the American Board of Internal Medicine (ABIM) and the ABIM Foundation, William Little, MD (who also receives considerable compensation from the ABIM) and Henry Ting, MD were speakers. I learned several important things at that session about the 2013 MOC examination results. First, I learned that the pass rate this year (2013) for internal medicine specialists was 86%, and for cardiac electrophysiologists was 84%. This means that fourteen percent of internists and sixteen percent of cardiac elecrophysiologists did not pass their test. (We were assured that 97% "ultimately" pass, however, but no data were supplied to the audience to this effect). The second thing I learned directly from Dr. Baron yesterday during the question and answer period was this: the ABIM has never studied the psychological, social, or financial impact that NOT passing the MOC process upon physician test-takers. This is not a small issue, especially if one considers that many hospitals are beginning to tie the ongoing Maintenance of Certification process to the issuance of hospital privileges to practice medicine. How could anyone trained in the ethics of scientific study and research permit such an egregious oversight to the protection of physicians? Let's examine each of these principles described in the Belmont Report in regards to MOC testing. Respect for persons incorporates at least two ethical convictions: first, that individuals should be treated as autonomous agents, and second, that persons with diminished autonomy are entitled to protection. Today, physicians are "persons with diminished authority" in the certification and licensure discussion. The decision to invoke every-two-year testing was imposed by leadership of several physician organizations whose leadership have had strong ties to government agencies (including the Center for Medicare and Medicaid Services, a la Dr. Baron) without the approval of their membership. Further, the MOC process is already being used by some hospitals as a lever to dispense hospital privileges without proof that the MOC process assures physician quality, however might have been defined. Persons are treated in an ethical manner not only by respecting their decisions and protecting them from harm, but also by making efforts to secure their well-being. Such treatment falls under the principle of beneficence. The term "beneficence" is often understood to cover acts of kindness or charity that go beyond strict obligation. In this document, beneficence is understood in a stronger sense, as an obligation. Two general rules have been formulated as complementary expressions of beneficent actions in this sense: (1) do not harm and (2) maximize possible benefits and minimize possible harms. Given the fact that the negative consequences of failing to re-certify in medicine are very real for doctors, failing to pass the ABIM's tests may, in fact, harm them. No attempt to minimize harm to physicians has occurred. No attempt has been made to warn physicians about the negative consequences of what might happen to them if they fail to maintain their certification in good "status." Worse still: not allowing physicians to practice medicine may actually harm, rather than benefit, the doctor's patients! The ABMS and ABIM have clearly turned a blind eye to this possibility. Who ought to receive the benefits of research and bear its burdens? This is a question of justice, in the sense of "fairness in distribution" or "what is deserved." An injustice occurs when some benefit to which a person is entitled is denied without good reason or when some burden is imposed unduly. Another way of conceiving the principle of justice is that equals ought to be treated equally. However, this statement requires explication. Who is equal and who is unequal? What considerations justify departure from equal distribution? Almost all commentators allow that distinctions based on experience, age, deprivation, competence, merit and position do sometimes constitute criteria justifying differential treatment for certain purposes. It is necessary, then, to explain in what respects people should be treated equally. There are several widely accepted formulations of just ways to distribute burdens and benefits. Each formulation mentions some relevant property on the basis of which burdens and benefits should be distributed. These formulations are (1) to each person an equal share, (2) to each person according to individual need, (3) to each person according to individual effort, (4) to each person according to societal contribution, and (5) to each person according to merit. So who is served by the Maintenance of Certification process, really? Are patients? Doctors? Or the leadership of ABIM? There are significant financial incentives driving the marketing of the ABIM's ongoing MOC process to America's physicians. From the ABIM's own 2012 Form 990 that I could retrieve, the ABIM earned $30,661,314 from their members for examination fees, $17,509,141 for Maintenance of Certification, and an additional $970,415 for exam development, supplying duplicate certificates, and re-scores of the examination. Of the total revenues reported by the ABIM in 2011 ($49,304,645) fully 48.6% ($23,937,881) went to staff salaries, other compensation, and employee benefits. Christine Cassels, MD alone (who served as President and CEO at the time), earned $786,751 that year and had her spouse's travel fees to meetings thrown in, too. It goes without saying that the leadership of these organizations have received salaries far higher than most of their physician members. Justice (as defined by the Belmont Report) can hardly be served when scales are tipped so heavily toward those of our own profession that stand to benefit so handsomely from this certification process. It is time that doctors and patients understand exactly what has transpired with the foisting of the ongoing MOC process upon America's physicians. Just as the Tuskegee experiments in Macon County Alabama did years ago, well-meaning members of our profession have represented physician "quality" by their own standards that include the ability to perform a serious of test- and survey-taking exercises without responsibly admitting the harms this process might have on their colleagues and their patients. Like the serious breaches of ethical standards that occurred when doctors worked "for the glory of science" in the Tuskegee era, this unfortunate unproven experiment of MOC re-certification by the ABIM continues unabated without checks and balances. It is time for this injustice against physicians to stop. Responsible physicians and their patients everywhere need to rise up and demand accountability by the ABIM for their ethical breaches that have occurred. The heavy marketing of the benefit of this process without acknowledging its potential harms is dangerous to both doctors and patients. Further, it is not okay to entrap physicians by making them pay for an unproven process that could destroy their social status and ability to earn a living. To believe otherwise is about as unethical as it gets. P.S. : Here's a link to an anti-MOC petition underway. The new MOC requirements remind me of Obamacare. 'Let's just roll it out and worry about fixing it later.' Cram it down the throats of physicians. Then they use the old excuse of ensuring that the public is getting the best doctors which sounds like raising taxes because 'it's for the kids'. Prior to these changes, were patients seeing incompetent physicians. Is the 30% reduction in cardiovascular mortality touted by the ACC a result of physician incompetence? Is the dramatic reduction in stent usage over the last five years due to interventional cardiologists inability to follow guidelines? How far will it go to assure the public that they have a competent doctor? Should we all wear GoPro video cameras so ABIM can monitor us? Where does it stop? Tuskegee? Really dude? Not Nazi doctor experiments in concentration camps? Feels more like the latter to me....think you are going to get spanked for the analogy. But seriously, I hate the MOC process as much as the next person, and agree 100% that it should have been pretested-- tempted to say on pediatricians or pathologists, but hard to show an effect on results/outcomes, so cards and CT surgeons probably best guinea pigs-- but you could make the same argument (that there is a lack of supportive evidence) for several steps in the path towards being able to hang your M.D. shingle residencies, initial board certification, high school graduation, etc. And look at it form the patient's perspective. Take away the your personal knowledge of who the good docs are in your area and find a "good" cardiologist. Isn't BC a good start? The ship has sailed on professional autonomy, for better or worse. Police Officers seldom go anywhere without a camera rolling. Pharmacists have cameras recording every pill they dispense. Teachers and students are meaninglessly tested and certified ad infinitum, and video evaluation is being pushed for every classroom. I wish you well in this battle, but the truth is that collectively, as a culture, we've decided that everyone needs to be over-monitored and over-managed in order to prevent inadequate performance by a few. Once the monitoring and managing class get its nose in the tent, it's all over for the worker bees. Perhaps you can take some solace in the fact that you're not alone? I too hate MOC and I applaud your valiant efforts at curbing the ABIM and their clowns. That said, the ABIM is not killing any doctor or allowing them to die by making us do the idiotic modules they have come up with. There is a profound distinction between Tuskegee and MOC and some analogies are best left untouched out of respect for those involved. There,a spanking! Like some other commenters I agree with the sentiment about MOC process being horrible. That said, the comparison of MOC with Tuskegee is one of the most over-dramatic things I've heard in a long time. Is it any wonder the public sees us in the medical profession as prima donnas? Jay D and the other anonymous commenters who have criticized my analogy to Tuskegee: you each make very valid points. No physician that I know of has died from the MOC process and the use of this analogy was propably inappropriate in retrospect. I apologize to everyone offended by this analogy here and will modify this post to reflect this soon. But I should say now before I head off to see real patients, that I stand behind my premise of the violations of the principles of human experimentation outlined by the Belmont Report and which was written, in part, with the framing of the horrible Tuskegee situation as its backdrop. Doctors are finally waking up to the realities of how these non-representative so-called "professional" bodies are potentially harming physicians, and perhaps their patients, and are beginning to mobilize. For this, I do not apologize and perhaps a better analogy would have been a small woman who decided to sit in the back of a bus in the 1960s. Thank you and please do not change your note. Fall 2013: For this Maintenance of Certification exam, 5,634 candidates took the test with a pass rate of 71%. First-time test takers (4001 of them) passed at a rate of 78%. Sometimes exaggeration helps to open eyes. Now I ask all my colleagues who are Residency/Fellowship Program Directors "Is your training worth only 10 years?" Because, according ABMS, everybody needs to relearn & retest every 10 years. I propose that every ten years all practicing cardiologists should be required to repeat a year of fellowship. This would improve patient care. If you oppose my plan, then you must hate good patient care. This is the best thing for our patients. I enter the concern from the world of healthcare for the incarcerated, where failure is defined as "deliberate indifference to serious medical need." The concept is entirely fitting when people make changes that are indifferent to their effects on others. It is similar to a principle called "moral hazard" in disowning risk. Divide and rule, said Stalin. The Board-Certified can breathe a sigh of relief as they take the non-Board-Certified. But nobody counts as a good guy under tyrannical behavior. The next round,the Board Certification won't stop them, no. The Quislings go in the second round. Always. Anonymous- no, no. Doctors suicide at a fairly high rate. Do they do so for no reason whatsoever? I doubt it. Have they heard of the risk factors for suicide? Of course. x dollars/year for 10 years is not the truth. Many physicians take time away from the practice and their patients and also have less time for the family/children during the prep time. The practices owned by hospitals may pay for certification, but provide no help in patient improvement modules which is again a burden on physicians time/mandatory for quality improvement/time spent reviewing data/uploading surveys. Patients are not interested in filling more surveys. The psychological burden is Huge. Analogies. Is it time to update and revisit this article? Associating with an overly zealous political organization like the ABIM will sully your reputation and besmirch your family. Stop it. When you consider that has been directly and convincingly linked to deaths and MOC is the illicit funding source, we have a direct analogy to a great many atrocious political patterns and heinous medical behaviors of the past. History unchecked repeats itself. Humans are conditioned to err morally just as we are taught to act from moral principles. I would not apologize for reminding us of the past, however appropriate or far fetched it seems to some. If we go to sleep about the atrocities of the past, and are bullied out of using comparisons by politicians and the media we are doomed to repeat. You see how subtle this all is? Truth is truth when spoken "plain and direct". The web of deceit is often indirect slanted and complicated in its many forms. It is easy to distinguish truth from fiction if we take a step back and really look and listen. Taking MOC at its face value, causally, and considering the underlying effects and implications of the whole organization including MOC, (and discussing ABIM without any inhibition), I diagnose the corporation to have a highly contagious form of "Mr. Hyde" syndrome with an admixture of tertiary syphilis. The ABIM is having severe seizures with cognitive impairment as the "Little ABMS MOC Buggers" have reached and lodged themselves in the ABIM's executive personnel as they try to spread the good bugs of MOC to condition physicians' and patients' brains with lies. Whatever they say at the ABIM, you can believe the opposite. Rich Baron's head is having seizures when he speaks any lie. It is the Pinocchio effect. The biggest lie to date is when he said they got it wrong. He did not mean that. He meant they got it right, but sorry they were caught red-handed in the total MOC lie. In other words, MOC does not look very healthy for society as an understatement of the tenth magnitude. And MOC as a guiding lodestar is even more detrimental and deadly to the ABMS itself; as all are implicated in a political game of harming the patient/physician population willingly and consciously. But this culpability of harming patient and physician is especially true of the ABIM internal policy makers, which are the brain, nerves and guts of the ABIM and ABMS cleptocracy. They (ABMS-ABIM) are really sick, and their is not one competent physician on duty working there. The study quantifying actual deaths in relation to the Choosing Wisely campaign has not been entertained or attempted yet. That is alarming. The "FDA" should require that the ABIM and its Foundation pay for an ongoing independent study. The side effects of the "mental drug" called is a metaphorical pill being shoved down the throats of many vulnerable physicians and their vulnerable patients; and the analogy should ring many alarm bells inside us as it does indeed relate to Tuskegee. Yes, I said Tuskegee...only to the magnitude of a million times as the discussion and implementation of Choosing Wisely is on an international scale! That should be frightening and shake awake the core values of any student of history, but especially anyone who has already lost family members to this misguided corrupt global medical enterprise. I will dare say this is as horrendous as a nuclear bomb dropped on the world. It's total power of death producing repercussions will only be calculable years from now, if we don't take a stand and stop Choosing Wisely and its fraudulent funding source MOC. How dare you, ABIM, RWJ, ACP and all the rest of you who would attempt to debilitate or kill our precious family members with your total medical negligence!